Welcome to Crystal Peaks, the ranch of rescued dreams. 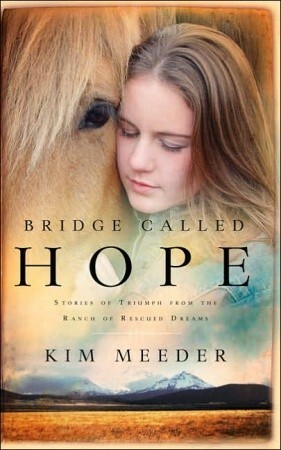 Author Kim Meeder uses her gift of storytelling to capture the stories of the abused horses and needy children who come to her ranch for healing. From a young man convinced he cannot be loved, to horses fighting for their lives, the stories in this book show God’s grace as the dying light of hope is revived time and again. I purchased this book two or three years ago at a homeschool conference. I can remember sitting on the hotel bed in the evening with tears streaming down my face as I read the first chapter, Proof. After reading the entire book and the companion book, Hope Rising, that first story remains my favorite. For a girl who grew up with “horse fever” and has grown into a deep caring for the fatherless, these books were great finds, and I continue to treasure them. Me too! I admired this cover in the CBD catalogue for probably two years before I finally purchased it. Also, just wanted to say, i just found your website, and it’s really good! I love reading, so seeing all these reviews…well it just adds to my to-read list! I’m looking forward to looking at your review!